The Animal Inflatable Globe by Caly is a colourful globe featuring 272 beautiful illustrations of the different animals that inhabit the planet. The mapping has been simplified, and while the boundaries are approximately drawn, each country is named. The colouring indicates the different types of climates and vegetation, from monsoon to polar regions and from tropical forest to deserts. Latitude and longitude are shown at 10º intervals, the tropics and the equator lines as shown as well as an indicative time line. 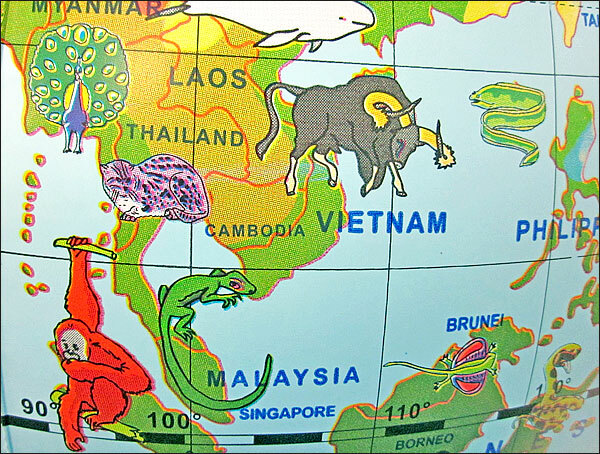 A large number of animals are illustrated on the continents they inhabit, from the Komodo Dragon and the Portuguese Man O’War of Indonesia to the Honey Badger and Meerkat of Europe and Africa. To facilitate access to the names of the animals, the globe has been divided in 6 sections from A to F, and an outline of each sector features on a separate leaflet, numbering and naming each animal. The leaflet also provides a couple of ideas for games to play with globe. The globes comes flat packed and it easy to transport. 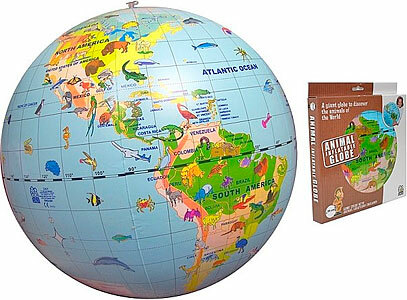 This is a beautiful and educational globe which makes learning fun.